Click here to go to the download area and try out the calculator. Now there's two, check out Vlad's calculator it probably is better than the original Microwaves101 calculator. The calculator we are talking about is a Microwaves101 download was a gift from Mark D who wrote it sometime during the last century, back when he did "real" work. We decided to add this page you are reading to illustrate the capabilities of this very cool download. This spreadsheet is used to calculate inductor and capacitor values for Chebyshev filters. 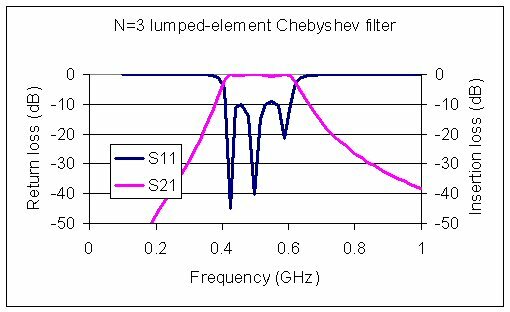 It can calculate low-pass, high-pass and bandpass lumped-element Chebyshev filters, of third, fourth and fifth order (N=3, N=4 and N=5). In our recently revised filter spreadsheet (version 2B updated January 10, 2005) we've added plot capabilities inside the Excel spreadsheet. This is VERY COOL, you can design a filter in REAL TIME now, instead of exporting the capacitor and inductor values to an ADS file! A Chebyshev filter is an equal-ripple filter, and it has an exact mathematical solution (the arithmetic is buried somewhere in the download). The order of the filter (N=3, N=4, etc.) is determined by how many lumped elements (capacitors and inductors) the filter has. In the case of bandpass filters, the capacitors and inductors are paired into resonators; an N=5 filter will have five capacitors and five inductors. Also, for a bandpass filter, the order equal to how many dips there are in the frequency response. The steepness of the skirts is a dependent variable. If you want steeper skirts (more rejection), allow more ripple in the pass-band, or go to a higher order. We've recently fixed some labeling and added figures in the spreadsheet to clarify which element is which. It's much better, but we noticed some bugs. The N=4 filter calculator has some major problems, so we have deleted it from this release. The N=3 and N=5 filter responses have been checked against ADS and work as intended, EXCEPT the HPF filters don't work properly, SO USE HPF AT YOUR OWN RISK! When you enter the passband frequencies for the filter, they are in Hertz. 10 GHz would be entered 1e10. The start and stop frequencies for the plot are entered in GHz. We plan to fix this inconsistency some day so you can enter them both in GHz. Much of the spreadsheet is locked so you can't mess with it, but the plots can be edited. The range of data is also up to the user, but keep in mind there are only 51 data points in the plots. The plot is unprotected, so you can mess with the axes as much as you want. the start and stop frequencies for the plot. Note that once you have obtained a filter design, its frequency break points can be scaled in frequency by scaling the capacitances and inductors inversely (for 10X in frequency, multiply all values by 1/10). We also recommend that you restrict the ripple to 0.5 dB or less, that way you will be working toward a 2.0:1 or better VSWR in the passband (approximately -10 dB). Remember, your lumped components will not always behave like ideal components, and this problem gets worse as you go up in frequency. You will need to look over data sheets and add in all parasitic items. These are not often given directly but can be computed from data such as the series resonant frequency of capacitors and the parallel resonant frequency of inductors. Unfortunately our free download can't help you with this, but it provides an excellent starting point for any lumped element filter design. Suppose someone wanted you to design a bandpass filter at 500 MHz, with a passband of 100 MHz (450 to 550 MHz, with 30 dB rejection at 200 MHz and 1 GHz, and VSWR of 2.0:1. Right away, you know that 0.5 dB ripple is required, because of the relationship between VSWR and ripple for a filter. Start with the lowest order filter, enter the passband and the ripple requirements. Adjust the start and stop frequencies for you particular filter; here we used 0.2 to 1.0 GHz. Remember, there are always 51 points, so it is important not to "waste" any of them outside of the passband and rejection points or the plot will miss some of the dips in S11. If the passband is 450-550 MHz, we recommend adding some "guard band". We used 400 to 600 MHz in this example. 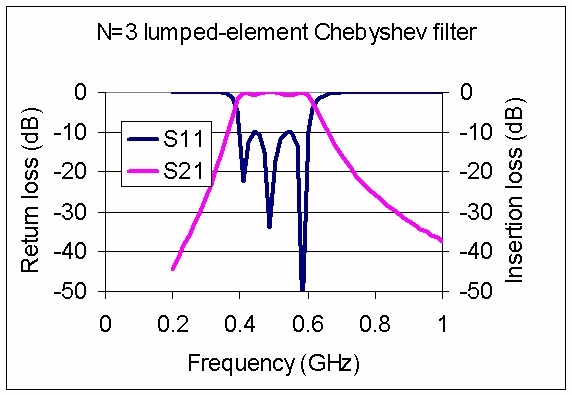 Below we show the response of a N=3 Chebyshev filter, with 0.5 dB ripple, 400-600 MHz. The network is shown graphically, as well as the capacitor and inductor values for tee and pi. Looks like the filter meets our rejection requirements, so there is no reason to go to a higher-order filter in this case! Do you sense a pattern here? These values are called RETMA values, which dates back to 1957 and the Radio Electron Television Manufacturing Association, which is no longer around. But JEDEC (the Joint Electron Device Engineering Council), a part of the Electronic Industries Alliance (EIA) has a nice web page that will bring you up to date on the history of this. Now you need to select RETMA components, or perhaps series or parallel combinations of parts from the RETMA list that give you an acceptable frequency response. Here's the slightly corrupted RETMA-value response. It took us one ham sandwich to design this filter. Suppose you want a 75 ohm filter? Just take the computed 50 ohm results, multiply the inductors by 1.5, and divide the capacitors by 1.5! Just because you have found available components that show you an acceptable response on the very first try using our simple spreadsheet, don't think you are done yet! First, you need to read about how to calculate parasitic elements from the resonant frequencies that are typically shown on vendor data sheets. We've got you covered. For inductors, go here. For capacitors, go here. For this step, you are going to need some "real" EDA software, such as Agilent ADS. The first step is determining some of the parasitic elements in the network.